the scent of green bananas: cake for the keikis. Posted by santos. This entry was posted on 20060322 at 12:04 AM You can skip to the end and leave a response. you BAKED a paradise cake?!?!? i started reading and was like...aw, she went out and got a paradise cake...and then i find out you MADE it. LOL! incredible. 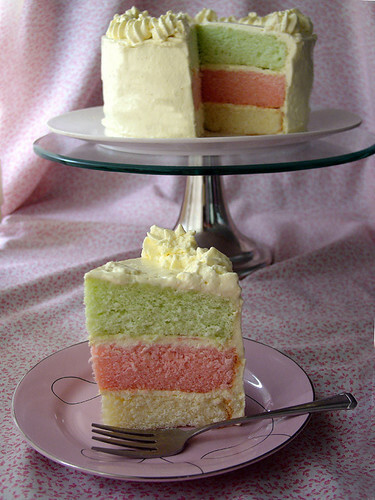 I had heard of the guava cake...but not a paradise cake with three layers! It looks so pretty - but I like pastels, so I guess you might need some of that food coloring to get those tropical hues! Makes me wish I was in the islands instead of freezing here! I can't believe you actually made a paradise cake yourself! Seriously, your photos are beautiful. aesthetically, i think this begs for an accompanying slice of spumoni! santos... i am still drooling over this cake you made. it looks so delicious and fluffy. 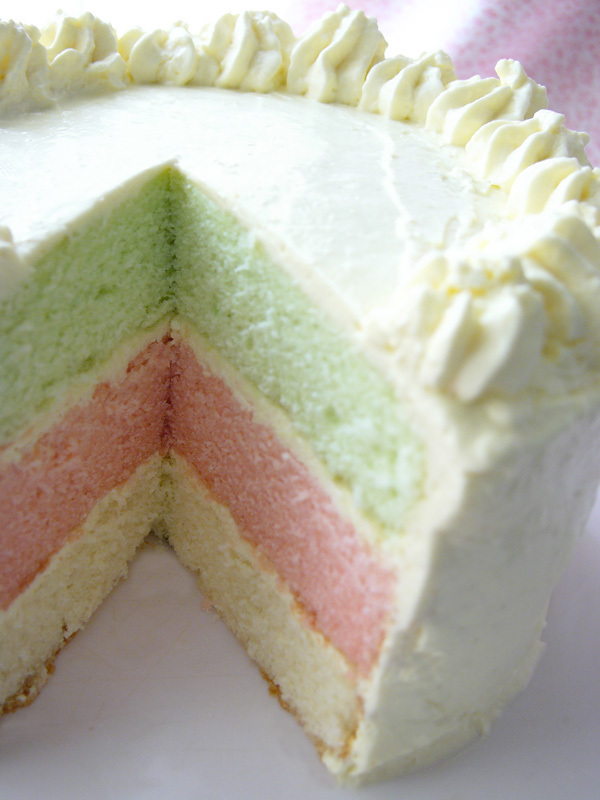 i am in need of layer cake of any kind at the moment! i like the idea of gauva jelly/jam spread on the pink layer... i think that would work! It's gorgeous - I love the colors just as they are. Chiffon is the quintessential japanese cake. Is there any difference between sponge cake and chiffon cake or is it just a language thingy? delicious lifer, i had to. i can get guava chiffon here, but no chance of lime nor lilikoi. baking bastards! miss anita, i hadn't either! where've i been, and like, i've spend a heckuvalota time in hawaii, too. stay warm! kirkyoso, it was actually quite easy. i'll definitely do it again, only maybe layer the cakes with haupia for more of island feel. tokyoastrogirl, thanks for the tip--i'm definitely going to try that. tg, that's exactly what i was thinking. i thought of the wedding scene in the novel of "the godfather"; this would be the cake that connie gets all greedy over, and scoops up all the cream frosting. i would really like to redo this cake with cherry, pistachio and amaretto, i think it would be super delicious. saff, i am glad i didn't run over it either. i would have, but there's construction going on across the street. i'm sure the workers would not approve of wasted food. my little cathy, i do too. now. after staring at it for a long while. shukumei, and without the evil stares! my little ponies stare at me and scare me. 3. a combination of 1. and 2.
i tend to use butter for sponge cakes and separate the eggs, and i end up with a dry, bouncy mess. i think i am going to make a vanilla version of this chiffon cake recipe and just call it a sponge cake if someone wants a sponge cake. I think I like 4 but I have much to learn. It wasn't that long ago I thought chiffon was the material they used for bridesmaid's dresses. >It wasn't that long ago I thought chiffon was the material they used for bridesmaid's dresses. no, that would be sponge. I never thought I'd say this, but this cake really takes the cake, Santos. Paradise cake flavored with guava, lime, and lilikoi - I can't even begin to imagine what it tastes like; it's far too fabulous for me to fathom! Incidentally, seeing how I'm not sure where to get lilikoi flavoring here in the Philippines, would mango be a suitable substitute for it? midge, mango sounds like it would be delicious. i think pineapple would be a good substitute as well. am off to Nice france then to Italy if its a concrete yes on my part we will be cruising the usual run st trop, cannes, portofino, sardignia then june sicily. In case you are not aware, Betty Shimabukuro and The Honolulu Star Bulletin have put out a cookbook. Yummy-looking cake, I would love to try it, eating not baking (hehehe). Just like what Midge said, I don't know where I can find lilikoi here in Pinas. Oh my gosh! That looks gorgeous! Too gorgeous to eat!!!!!!! But I'm certain it tastes divine. The colors are perfect, dear! i do believe i just died and went to heaven when i saw these photographs, and that cake. oh my. it looks delicious and yummy. but it's also a visual delight. maybe this is a link that might interest you as well. www.botanicalark.com which is a project that a friend of mine supports. he photographed and helped publish their book, with all proceeds going to support the botanical ark. passionfruit cake and salads with exotic fruits. my mouth melts everytime i just look at it! so glad that i discovered this blog! amie, i like the cakestand too--simple, yet a little different with the glass and chrome. j--i am so attracted to shop bought sometimes. must be the 10-year old girl trapped in me. anon--i knew she had a book, but for some reason i thought it was old and didn't think it was still in print. thanks for the link. lani, i used a passionfruit concentrate from the philippines; it's from a small family company called kablon farms based in tupi, south cotabato. i find their products in different places--sometimes in the tiangge at greenhills, but mostly at food fairs. i'm still trying to find their guava concentrate! hello angela, thanks for stopping by and taking the time to comment, i appreciate it! Gosh that cake looks like it could waltz! Yummmmmy! bee, what a delightful description! hello linq! no worries about the questions. yes, this recipe makes a lot of cake, so you would want to use half. for salad oil, you can use any vegetable or nut oil, but olive oil will be too heavy. 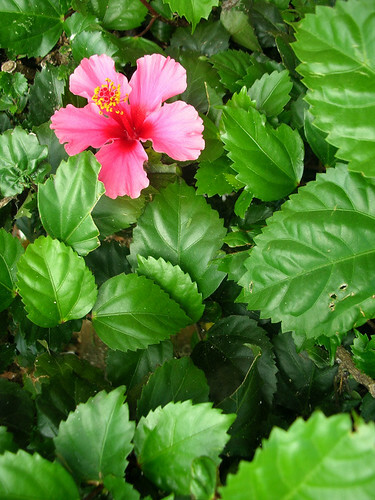 you can use guava juice, but the taste won't be as strong. I would like to replicate this gorgeous cake for a family function. Would you mind telling what size pans did you use for the three layers. hi karen! i used six 8-inch round pans to make two 3-layer cakes. i think betty shimabukuro's recipe calls for 1 11-by-13-inch rectagular pan, which might work better for a large gathering. The large cake would be better for a large crowd, but looking at Betty S's recipe it isn't a triple colour/flavour cake, is it? or maybe I'm looking at the wrong pic and recipe. That is a lot of cake. Well worth making for the effect though. I also do morning teas for a company so I can use it for them as well as the family do. its linq again here.tks for the answers to my question.just to clarify matters.when u said u used half of the mixture,does it mean that using half of the mixture, u separated it into 3 flavours? or use the whole amount n divide that into 3 flavours? Anyway,am going out tomorrow to buy the necessary requisites.Have to go to baking supplies shop. I have decided to use the guava,mango n lime juices n taking ur advice into consideration,will be buying the corresponding fruis extracts to 'up' the flavour quota.Thanks again for the inspiration n the beautiful pictures.I wouldn't have even thought of the out of the world possibilities if it wasn't for ur blog. Food lovers everywhere unite! !Thanks again. I had emailed king hawaiian for the recipe but they said they only have it for 60-80 layers at a time. Then I found this website! I will definately try this recipes because all I can think about is my trip to CA and eating that yummy cake!! hi linq! i didn't realize you had left a comment here, i'm sorry it has taken so long to respond. what i meant was that you can make half the recipe for each layer of cake; you'd be making three separate half-recipes for three separate flavours. does that make sense? i don't know how to divide the batter and add the separate flavours, but if you can figure it out, it would mean you'd make far less cake! which is a good thing, because making three full batches of this recipe is really crazy if you don't need that much cake. hi anon! i haven't actually eaten a king's paradise cake, but i have had chiffon cakes from other hawaiian bakeries. this one really reminds me of the cakes at dee-lite bakery in honolulu. hopefully it will be close to what you are looking for. If you haven't found any guava flavoring, Lorann's Oils sells it. The cake looks great. I've been looking for a guava recipe. hi dee! thanks for the tip, i think i really need it to boost the flavour. I fall in love at my first sight looking at the pic here. So I decide it to make one somedays. I live in Indonesia a place where I can get lime, lilikoi and guava everywhere! But I've never read nor seen any cake like the one you made here! Thanks for the recipe, it's suburb! I add fresh lilikoi juice, fresh lime juice and fresg guava juice ...! Hi! The link to the StarBulletin recipe that you mentioned no longer exists! I've been desparately scouring the net for this recipe, but everyone just links to the same page. Do you happen to have the recipe still? Thanks-- your help is greatly appreciated! hi carol, the recipe was a basic chiffon cake that replaced guava juice concentrate for the water in the recipe, plus some food colouring. i don't have the recipe on hand; however, this one seems to be very much like the one i remember baking. if i come across the recipe, i'll post it in this comments section.